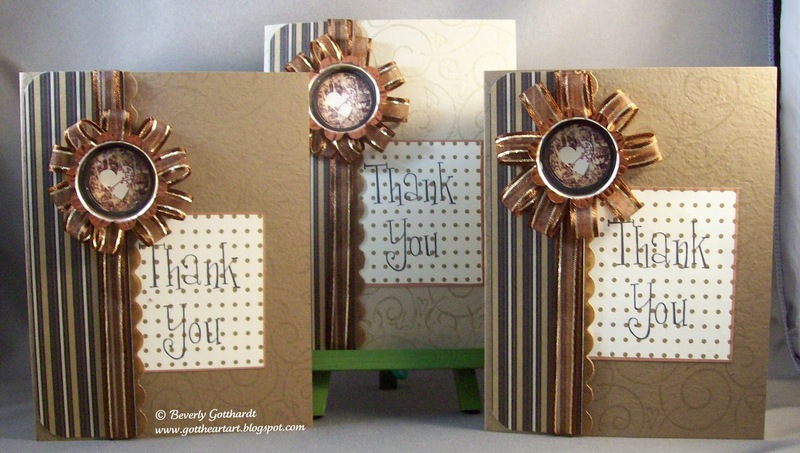 Going along with the theme of this challenge I have to thank Gingersnap for inspiring me to start on my thank you notes before the New Year rings in. I found these cute bottle caps with the flared edges and they just begged for some ribbon around them. I love this color combo, brown, cream, black, copper, and gold. Thank You Gingersnappers for all the badges, wins, and the month long guest spot I had earlier in the year. I'm looking forward to all the cool challenges you'll have for us in 2012. You have some really neat creative ideas! Lovely cards!!! What a cute idea! Happy New Year! I just signed up to follow you're blog. 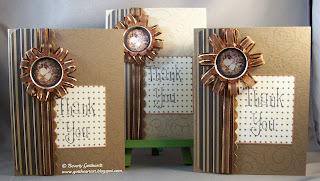 Love this card and congrats on the win of a GEM over at Gingersnaps Creations! These are really special, I adore your bottle caps! Love how you dressed up the bottle caps... beautiful cards, Beverly!